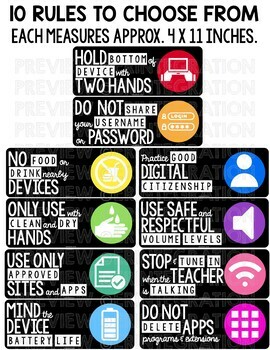 Rules posters for using Chromebooks, iPads, tablets, Kindles, laptops and more! 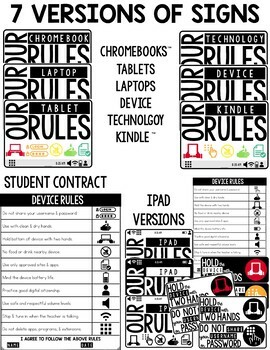 Also includes a student contract and 10 class rules posters to display vertically or on a bulletin board in 3 styles. 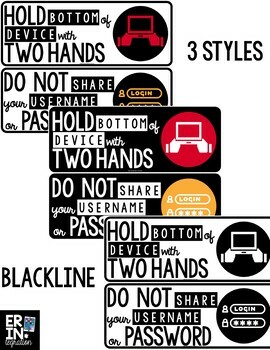 Blackline is included. Just print the rules you need or use them all! Each rule poster is a horizontal half sheet of paper approximately 4 x 11 inches. They look great hung vertically below the full page sign. Compliments any classroom decor. ★ One page student contract with all rules listed. -Do not share your username & password. -Use with clean & dry hands. -Hold bottom of device with two hands. -No food or drink nearby device. -Use only approved sites & apps. -Mind the device battery life. -Use safe and respectful volume levels. -Stop & tune in when the teacher is talking. -Do not delete apps, programs, & extensions. 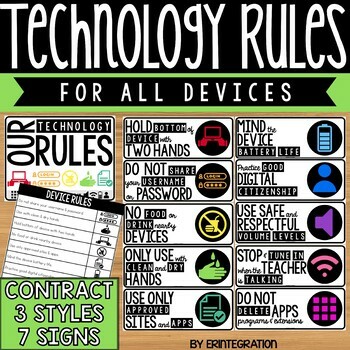 ★ Also includes an iPad version with contract, posters, and signs tweaked just for classrooms using iPads! This resources is NOT EDITABLE at this time.